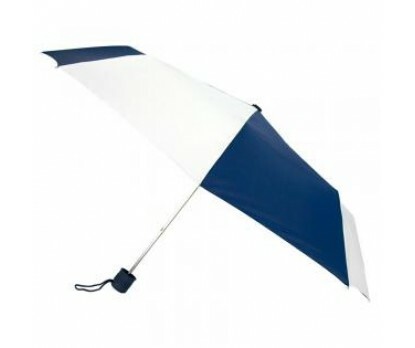 Customized navy & white 43” manual open mini fold umbrellas are largely employed by marketers who toy with these colors in their brand themes or those who are very particular about their first time investments. 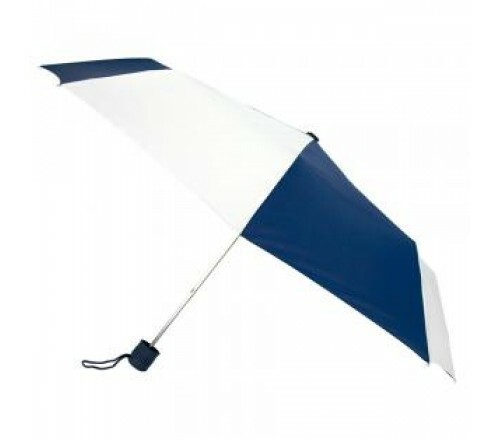 This umbrella is valued for its specialized features such as navy blue and white nylon fabric canopy, rubberized handle, steel windproof frame and manual open function. Personalized navy & white 43” manual open mini fold umbrellas can be gifted in any season because people find it highly utile. Logoed promotional navy & white 43” manual open mini fold umbrellas offer many advantages to marketers in the form of long service life and strong ability to keep a user fascinated. Dimensions - 43" arc - Closes to 10". Imprint area - 7"W x 6"H.